Isonychia is mostly important in the East and Midwest, where all the action is provided by Isonychia bicolor. The former species Isonychia sadleri and Isonychia harperi were recently discovered to be synonyms (Synonym: A former name of a taxon, usually a species. Entomologists frequently discover that two insects originally described as different species are one in the same, and they drop one of the names. The dropped name is said to be a synonym of the remaining name. These changes take a while to trickle into the common knowledge of anglers; for example, Baetis vagans is now a synonym of Baetis tricaudatus.) of bicolor. In the West, Isonychia hatches are not very important, and they may be attributed to several minor species, especially Isonychia velma. Some people say the Isonychia species are multibrooded (Multibrooded: Producing more than one generation in a single year. 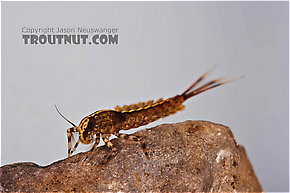 Baetis mayflies are a classic example. Insects which produce a single generation with two distinct peaks (like the June and September hatches of Isonychia bicolor mayflies) are not multibrooded, because the fall insects are offspring from the previous fall instead of the current year's spring. ), but this is not technically correct, even though their pattern of emergence is similar. In true multibrooded (Multibrooded: Producing more than one generation in a single year. Baetis mayflies are a classic example. Insects which produce a single generation with two distinct peaks (like the June and September hatches of Isonychia bicolor mayflies) are not multibrooded, because the fall insects are offspring from the previous fall instead of the current year's spring.) mayflies like the Baetidae, the flies emerging in midsummer or Fall are the offspring of the earlier hatch from the same year. In Isonychia, the Fall emergers are offspring from the previous Fall. They are present as half-grown nymphs when the first of their generation emerge. Isonychia duns may emerge on the surface or by crawling out onto shore. This behavior can vary within a single species, and it seems to depend on geographic location and the weather conditions. Isonychia duns molt into spinners within a couple days of hatching, and when they return they provide much more concentrated action than the emergence. They mate in swarms twenty to thirty feet in the air, and the females drop their eggs from high above the water before they join the males in falling spent (Spent: The wing position of many aquatic insects when they fall on the water after mating. The wings of both sides lay flat on the water. The word may be used to describe insects with their wings in that position, as well as the position itself.). Some conflicting accounts say the females oviposit by descending to dip the tips of their abdomens into the water over and over. I experienced a good Isonychia bicolor year on one northern Wisconsin river during which there were many duns for up to a month, but I never saw any spinners despite fishing appropriate riffles dozens of times at dusk. I have not solved this mystery, but there is more to timing these events than has been so far discovered. 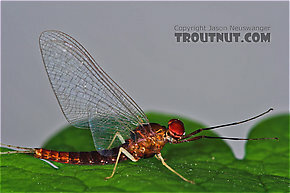 Isonychia nymphs are among of the fastest-swimming mayflies in the world. They can power their way through fast riffles with ease, and their imitations should be fished with fast twitches. They have tufts of setae (Seta: Little hairs on insects.) on the insides of their forelegs which they hold up in the current as nets to filter out plankon for food. Despite their superb plankton-feeding capabilities, they are also among the few types of predatory mayflies. They may feed on midge and caddis larvae and smaller mayfly nymphs. 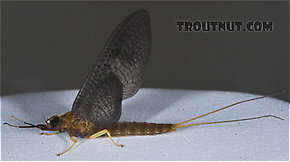 They are unique among mayflies in that they have extra tuft-shaped gills at the base of their fore legs, a structure normally found in stoneflies.